Most students first starting out on guitar will become familiar with the names of the six open strings right away. After learning a few “cowboy chords” and simple melodies, the player usually abandons open strings in favor of the higher positions. While this process is a natural and necessary part of a beginning guitarist’s development, it tends to result in a sense that the open strings are only for novices. However, this class shows that creative combinations of open strings and fretted notes can be used to generate a whole musical universe of harmonic and melodic possibilities that would otherwise be difficult or impossible using conventional approaches. Guitarists who play classical, country, blues, or rock have always combined fretted notes and open strings, but this technique has remained relatively unused by many jazz guitarists. 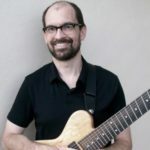 This class presents interesting and exciting ways to incorporate open strings not only for chord voicings but also for single-note lines which is an area that remains virtually unexplored in jazz guitar circles. This class offers numerous specific examples, and students are encouraged to use these ideas as inspiration for creating their own unique open-string techniques and concepts. Backing tracks for written examples and solos are included. I always enjoy Tom’s lessons. They are packed full of information (that you will be able to go back to again and again) but still everything is very well explained. I’ve already utilized several of the ideas he presents here in live situations and it has definitely made my comping much more interesting. I highly recommend this course. This lesson is not just about how to build chords or phrasing with open strings : it’s a window to new harmonic horizons, from Debussy-esque impressionism to the flavors of brazilian guitarists like Toninho Horta or Joao Bosco. Thanks Mr Lippincott. Another thorough dive into a too often overlooked aspect of guitar possibilities. Not done with it yet, but it’s a very full and interesting package. Thanks again, Tom, for presenting a useful view of the instrument.